Winnie & Walter July Rerun! Welcome to Winnie & Walter’s July Rerun! This month’s rerun stamp set is Mini Scenery: Madison. This set is on sale this month. 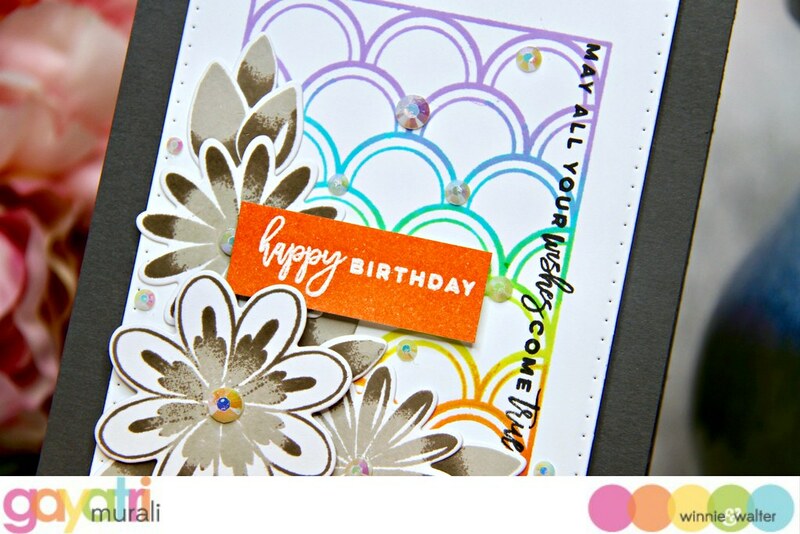 In this feature, we are showcasing this stamp set and there is also a challenge and giveaway. I will leave the details towards the end of this post. Here is my project using Mini Scenery Madison stamp. I stamped the image in rainbow colours using Altenew inks. I then die cut the panel using the smaller rectangle die from Essentials: Katherine Cutaway. 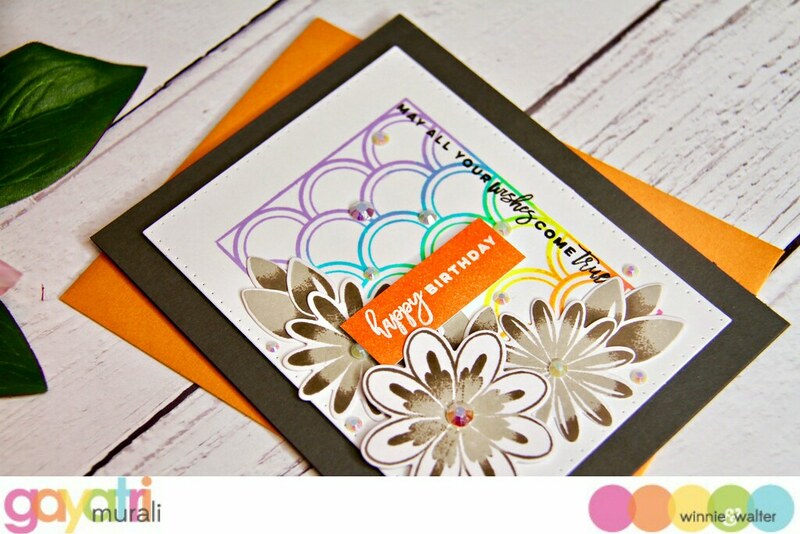 I stamped one sentiment from Sentimental: Birthday stamp set vertically on the rainbow stamped image. This is something I love doing. 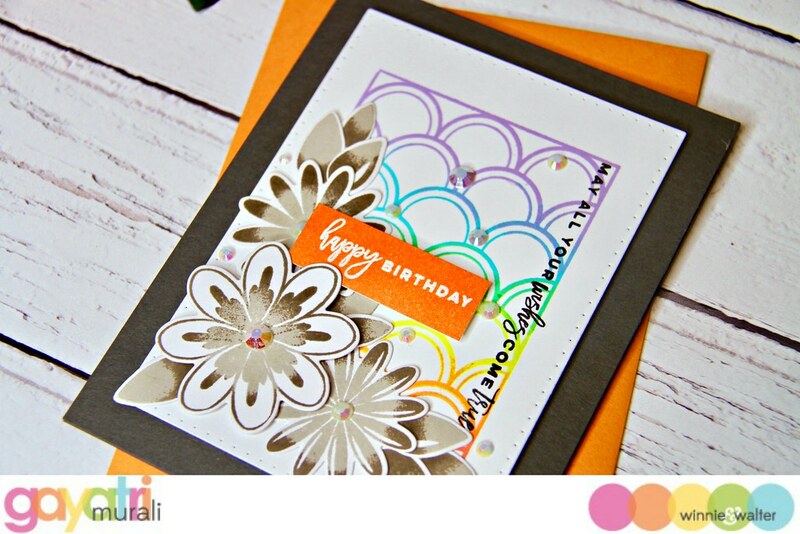 The primary sentiment I white heat embossed on a strip of white cardstock and sponged with orange ink from Altenew. 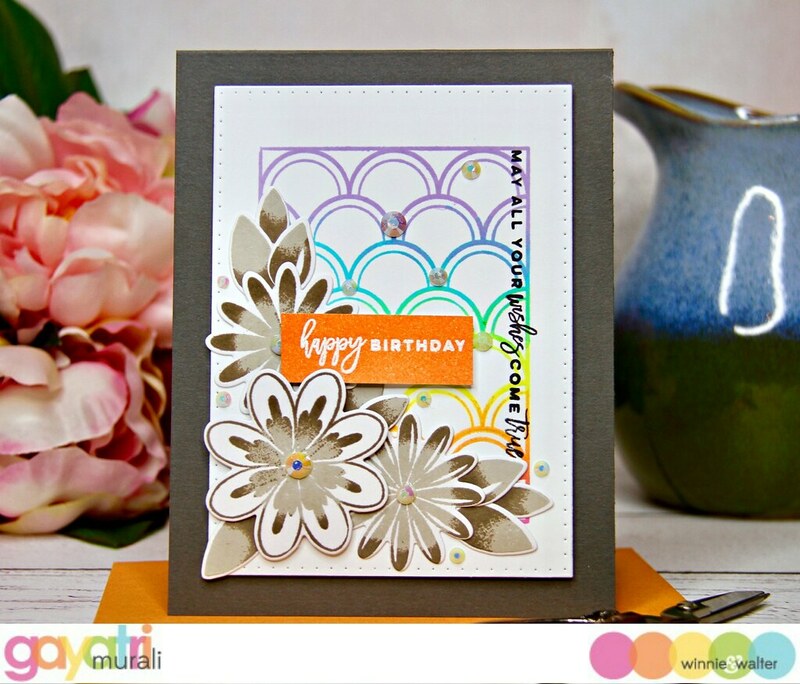 Since the Mini Scenery: Madison stamp is the focal of the project and is stamped in rainbow colour, the flowers I decided to stamp in grey colours. The flowers and leaves are a from In Blooms: Shirley’s Blooms. I also used to coordinating cutaway to cut them away. I made a cluster of the flowers and leaves on the bottom left of the panel. Then adhered the primary sentiment on the top of the cluster. This entire panel is adhered on a slate gray card base using foam adhesives for added dimension. Finally embellished with some diamonds. 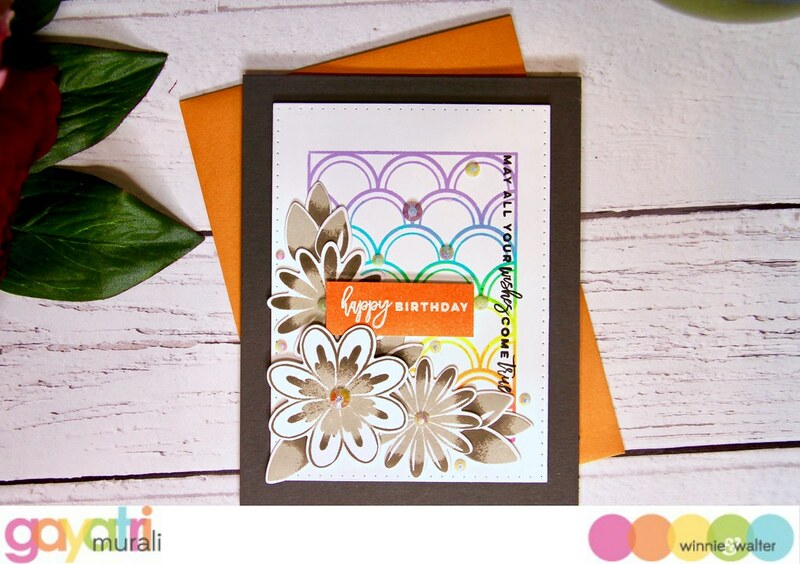 All the supplies I used to make this card are listed below. Here are the details of the rerun challenge. Create a new project using Mini Scenery: Madison. An alternative to usingMini Scenery: Madison is to create a new project using one of the projects featured in this post (or any Rerun post throughout August) as your inspiration. Make sure you use at least one (1) w&w product (this can include a freebie) in your project. If you choose the alternative to usingMini Scenery: Madison, please include in your post or project description which project inspired you and how. Link up your project here by 11:55 p.m. CST on July 31, 2018. 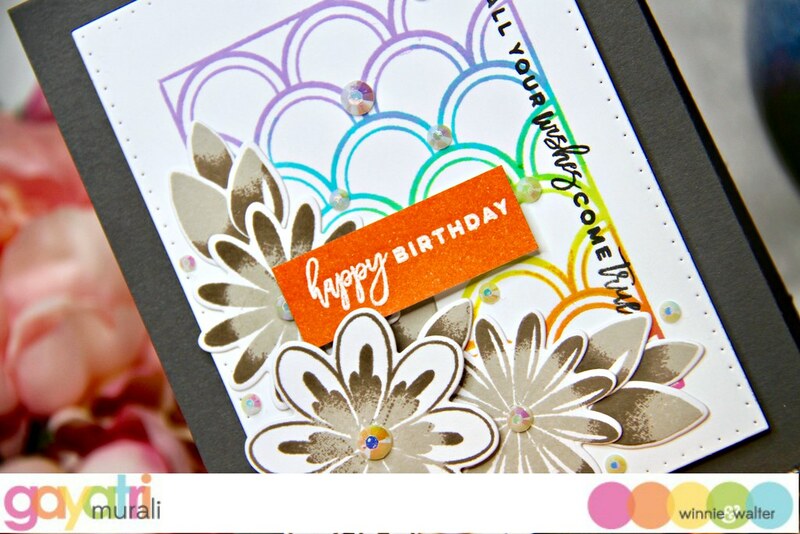 Check out Winnie & Walter Blog for more DT inspiration and the store to purchase this stamp set at a discount.